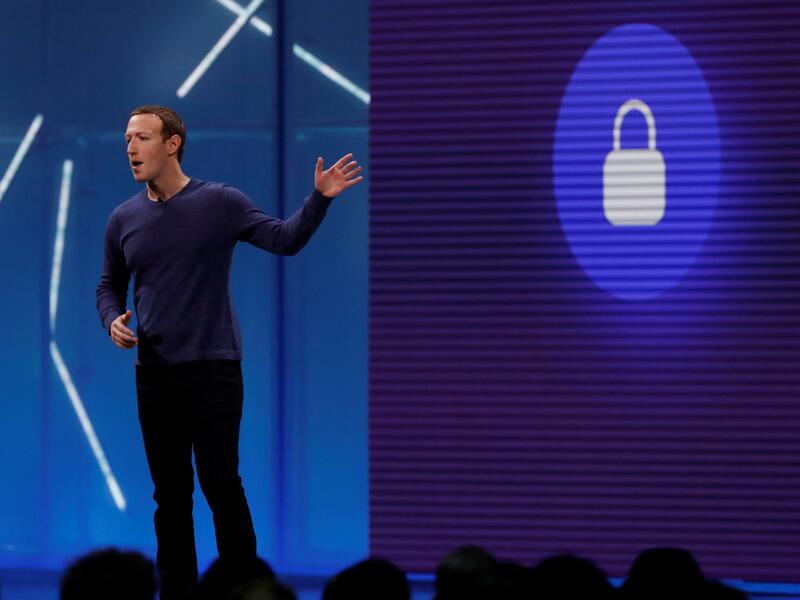 With Facebook Ban On White Extremism, International Norms Apply To U.S.
Facebook CEO Mark Zuckerberg speaks at the company's annual developers conference in San Jose, Calif., May 1, 2018. Facebook is beginning to enforce a ban on white nationalist content. The U.S. has long exported its culture abroad — think Coca-Cola, Hollywood and hip-hop. Facebook was once praised for spreading free-speech values. But the world is pushing back with different values, which Facebook is importing to the U.S. with the company's ban on white extremist content. The ban goes into effect worldwide this week. Experts and advocates who've long lobbied Facebook to pull potentially dangerous speech say the move — which is wrapped up in the U.S. culture wars — is the result of international pressure forcing the company's hand. A Facebook spokesperson says that under the new rules, users can't post in a celebratory way on its News Feed or Instagram: "I'm a white nationalist!" But they can post: "I'm a black nationalist!" John Spier, a Facebook user in Central California, says that's "ridiculous." Spier, a self-described libertarian, says everyone should have freedom of expression. "Even if they're an idiot. There's a lot of idiots in the world who say a lot of stupid things. We don't need to protect people from that," he says. What racism is and who can be racist is a debate that's getting louder in the U.S. Spier says that while Facebook claims to be a neutral platform, the company is taking the liberal side. "I know that the current popular mode of thought is that only white people can be racist," he says. "But I don't agree with that. I grew up as a minority white person in a largely Latino community and believe me, I know what racism feels like." According to Facebook leaders and civil rights advocates, this issue is not about speech but about safety. It's a well-documented fact: White extremists around the world are radicalizing men online, luring them into organized hate groups and promoting lone-wolf acts of terror. Heidi Beirich, director of the Southern Poverty Law Center's Intelligence Project, has been tracking extremist groups online for years, and making this point to Facebook: "White supremacists are as much a global movement and interconnected — in other words sharing ideas, sharing money, sharing tactics, sharing propaganda, visiting each other ... just like you see with Islamic extremists." Dylann Roof, who murdered nine people in a church basement in Charleston, S.C., in 2015, got radicalized through Google search. The white nationalist rally in Charlottesville, Va., in 2017 that left three dead and dozens injured, was organized on a Facebook page. The shooter charged with attacking two mosques in Christchurch, New Zealand, killing 50 people, used Facebook Live — an incredibly powerful broadcast tool. Beirich says Facebook's latest move is in reaction to the PR disaster in New Zealand, as well as pressure from law enforcement — particularly those in Europe, who are worried about white extremist gunmen. "That realization is dawning on the intelligence communities worldwide, and Facebook is hearing it from them," she says. A spokesperson tells NPR that the tech company made the unusual move of adding the Christchurch massacre footage to a terrorism database that had been focused on Islamic extremism. The spokesperson says the company will continue to add white extremist content to the GIFCT database, which tech giants share to censor the most violent content. Australia just approved a stringent law that threatens social media employees with prison time if they don't remove violent content "expeditiously." The United Kingdom is about to unveil legislation. Germany has passed tough hate speech laws that carry heavy fines. "The U.S. is behind the eight ball on this," Beirich says. "[President] Trump doesn't seem to be interested in these issues at all. And I think Facebook is reacting to that in a good way, I would argue." About 90 percent of Facebook users are outside the U.S. and the largest single market is now India. Last week, Facebook CEO Mark Zuckerberg called on governments around the world to create, in effect, a global standard for speech. That has never existed before. It's a long shot. But as Zuckerberg sees it, that's what needs to be engineered next. Facebook was once praised for spreading free speech values, but with the company's ban on white extremist content, we have reached an inflection point. The world is pushing back with different values, which are now being imported by Facebook to the U.S. Here's NPR's Aarti Shahani. SHAHANI: John Spier, self-described libertarian Facebook user in central California. SPIER: I feel like everyone should be able to have freedom of expression, even if they're an idiot. There's a lot of idiots in the world who say a lot of stupid things; we don't need to protect people from that. SHAHANI: What racism is, who can be racist - it's a debate that's getting louder in the U.S. Spier believes that, while Facebook claims to be a neutral platform, the company is taking the liberal side. SPIER: I know that the current popular mode of thought is that only white people can be racist, but I don't agree with that. I grew up as a minority white person in a largely Latino community, and believe me, I know what racism feels like. SHAHANI: Facebook is an NPR sponsor. According to Facebook leaders and civil rights advocates, this issue is not about speech but safety. It's a well-documented fact. White extremists around the world are radicalizing men online, luring them into organized hate groups and promoting lone wolf acts of terror. HEIDI BEIRICH: White supremacists are as much a global movement and interconnected - in other words, sharing ideas, sharing money, sharing tactics, sharing propaganda, visiting each other, et cetera, et cetera - just like you see with Islamic extremists. SHAHANI: Heidi Beirich with the Southern Poverty Law Center has been making this point to Facebook for years. Dylann Roof, who murdered nine people in a church basement in Charleston, got radicalized through Google search. The white nationalist rally in Charlottesville that left three dead and dozens injured was organized on a Facebook page. The Christchurch shooter in New Zealand used Facebook Live, an incredibly powerful broadcast tool. Beirich says the company's latest move is in reaction to the disaster in New Zealand and pressure from law enforcement, particularly those in Europe who are worried about white extremist gunmen. BEIRICH: That realization is dawning on the intelligence communities worldwide, and Facebook is hearing it from them. BEIRICH: The U.S. is behind the eight ball on this; Trump doesn't seem to be interested in these issues at all. And I think Facebook is reacting to that in a good way, I would argue. SHAHANI: About 90 percent of Facebook users are outside the U.S. Last week, Mark Zuckerberg called on governments around the world to create and effect a global standard for speech. That has never existed before. It's a long shot, and as Zuckerberg sees it, that's what needs to be engineered next. Aarti Shahani, NPR News. Transcript provided by NPR, Copyright NPR.